On the 101 anniversary of Estonia - Kanada Eestlane ja Globaalne Eestlane. Kuidas edasi? It is with bittersweet emotion that I write this, my final Independence Day greeting to Estonians across Canada, in my role as President of the Estonian Central Council in Canada. The past three-and-a-half years have passed extremely quickly, yet EKN has achieved much more than I could have dreamed of when we started our work in 2016. During that time, the presence and profile of our community in Canada has grown in leaps and bounds. We work closely with federal politicians from all parties on both sides of the Atlantic. Estonian politicians and policy makers also have great respect for EKN and its leadership on some of the most important issue facing the Estonian diaspora communities around the world. Thanks to EKN’s leadership, the Global Estonian movement has taken root in Estonia and in communities around the world: an identity that we can be proud of, is borderless and embraces all who feel Estonian. Traditionalists may argue that only those who speak Estonian can truly be Estonians. But, I can’t imagine that they would want to exclude the little girl whose father’s family, never taught him Estonian, yet dreams of taking his family to Hiiumaa one day to embrace his family’s Estonian heritage. Should language bar him from embracing his Estonian heritage and gifting it to his daughter and his non-Estonian wife? Our Estonian identity should be shared as widely as possible. And we must find and embrace as many of us as we can find. Together we are stronger. Our heritage is not bound to any bricks and mortar, or geography and it should be free for anyone to hold and adopt wherever they are. EKN has led the international effort to connect this concept with the Estonian government, going back to 2016, when Culture Minister Indrek Saar visited Toronto and was first introduced to it. Other cabinet ministers have since realized the power of this global identity, which was first introduced by Walter Rand at Metsaülikool and later mentioned as an aspiration for our people by President Lennart Meri. Over the past year, we have brought our friends at the Swedish Estonian Association, The Estonian American National Council and the World Estonian Council on board with the Global Estonian movement, and we are now working together to achieve greater cooperation and understanding to create a greater Global Estonian identity. The Estonian government, under the leadership of Justice Minister, Urmas Reinsalu, has adopted our proposal of creating a standing parliamentary committee for Global Estonian affairs, that will include representatives of our largest communities around the world. Other mainstream political parties have adopted their own Global Estonian election platforms, promising greater mutual communications and cooperation with our communities. There has never been a greater era of cooperation and potential for even greater collaboration, than there is today. The future, for our community, is bright indeed. In Toronto, a new centre is on the horizon, that we hope will be community centered, like our current Estonian House. 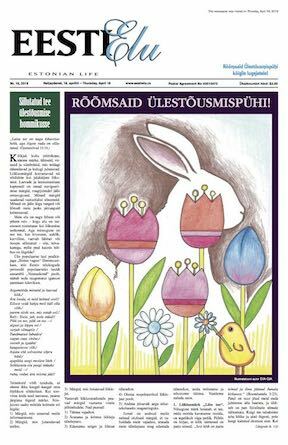 Our Estonian heritage schools and children’s camps will continue to thrive and grow, so long as the funding they depend on, and is intended for them, continues. Our community does need new leaders. Every active Estonian who believes in an Estonian future should stand for election to our larger community organizations: EKN, The Estonian Foundation, The Estonian Credit Union, and Ehatare. Our community needs new ideas and diverse leadership that reflects the makeup of our community. Most importantly, we need people who understand the needs of our community through their own active volunteerism and participation, to lead it. 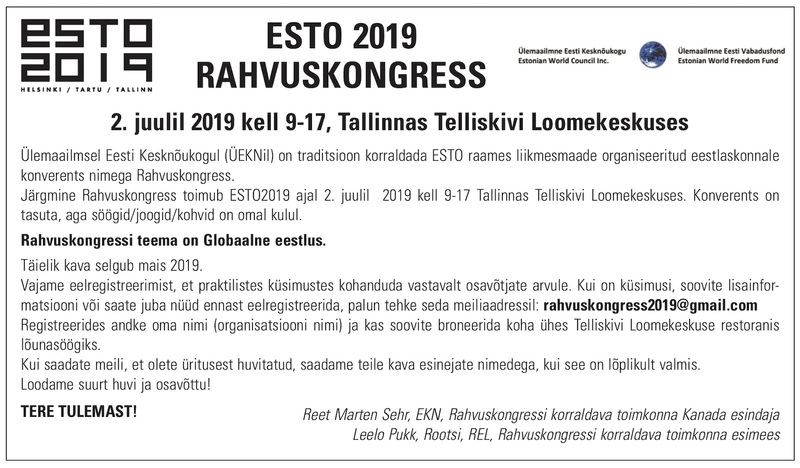 We look forward to the great Estonian activities that lay ahead for us in the coming year: ESTO2019, Laulu ja Tantsupidu, Seedrioru, Jõekääru and Kotkajärve camps, Estonian Music Week, Estdocs and the commemoration of the 80th Anniversary of the Molotov Ribbentrop Pact and so much more. As Estonian Canadians, we have so much to be proud: our achievements over the past 70 years and all that we aspire to achieve in the years ahead. Let us continue to work together in common cause, to support, and grow our Estonian communities across this country and join other Estonian communities around the world to create a greater Global Estonian identity.